It is rare that a week passes without a new stash of historical machines surfacing. But it is rarer still for an unknown historical supplier to be discovered. Thanks to Mike Skiver we learned about Henry Wencil Rebec (1889-1933) and his supply business. Mike came across the Rebec’s catalog and donated a copy to the Archive. Rebec’s also carried a couple of different styles of hand tools. One was a traditional bone handle outfit including designs, stencils and stencil power, stick of black ink, ¼ oz. of red pigment and a book of instructions, all for $2.50! 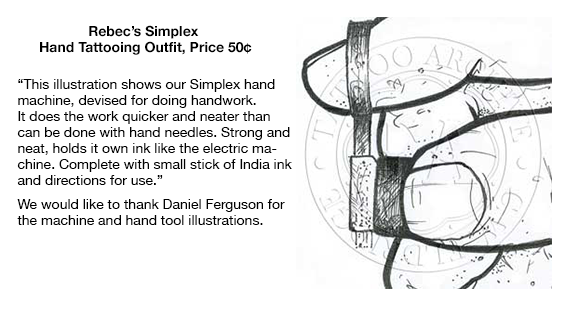 Rebec’s also sold what they called the “Simplex” hand-tattooing tool. This was a sliding metal device that was held between your thumb and middle finger while your index finger is placed into the metal loop and the needles move up and down with the movement of your index finger. 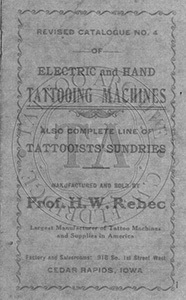 All of Rebec’s electric machines were designed for the use of connector cords. 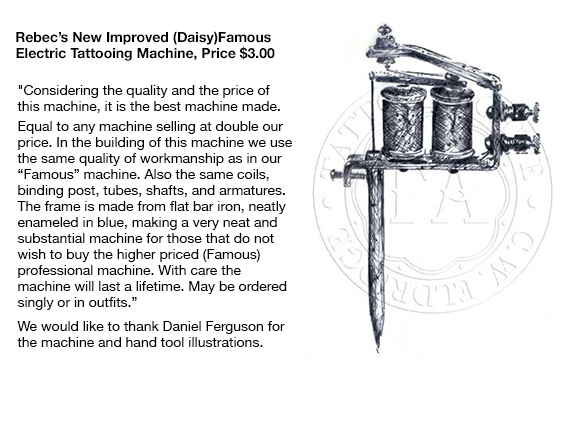 Based on the prices of the machines, I would date the catalog from the 1910s. 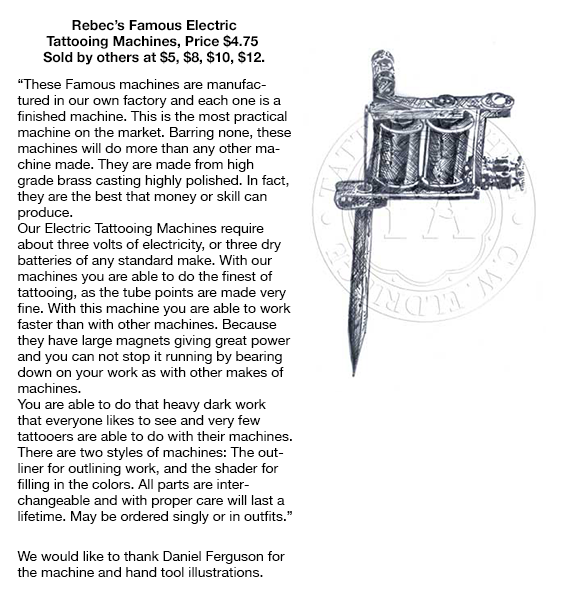 The catalog’s description states that machines can be bought singly or in outfits. These outfits were the starter kits of their era and would usually include machines, designs, stencils, pigment, connector cords, and that all-important instruction booklet. Thanks to Carmen Nyssen’s research we now know that Rebec was listed in the city directories for Cedar Rapides as a carpenter and later as a millwright in the early 1900s. 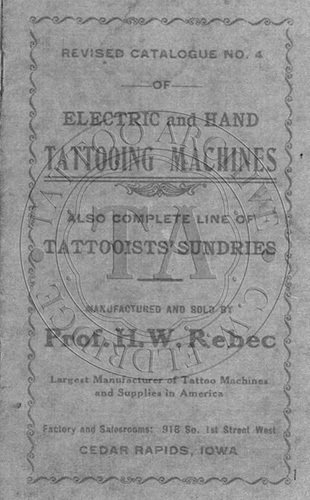 By the 1910s he had an advertisement in his local newspaper advertising his tattooing and in Billboard Magazine promoting his tattoo supplies. From the public record it looks like Henry Rebec tattooed on the side while keeping his day job. On October 13, 1916 the Cedar Rapids Tribune reported that Rebec was injured when a heavy beam crushed one of his hands. This appears to be the end of his tattoo business.